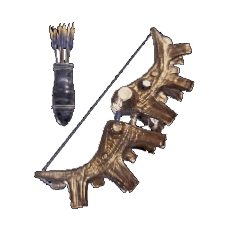 Gigacles is a Bow Weapon in Monster Hunter World (MHW). All weapons have unique properties relating to their Attack Power, Elemental Damage and various different looks. Please see Weapon Mechanics to fully understand the depth of your Hunter Arsenal. Gigacles has 2 different upgrade levels. It follows the Ore path, detailed below. Gigacles is part of an upgrade path for the Bow Weapon Tree. Below is an excerpt of the relevant Uragaan tree. Heavy bow for heavy armor and heavy metal music. R+RMB!!!!! Why bother w this? Look at rathslinger, 90 more fire attack, 20 percent affinity, only downside is 12 points of attack. Power coating also... How is this high rarity? Can a gigacles user defend this? Feels like a trash weapon that should be rarity 6. Not 8. With no Power Coating, this thing is trash at best.